Greetings and welcome to new and old subscribers. 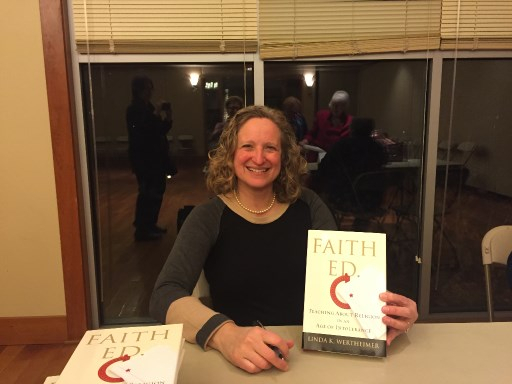 The photo above is from my most recent event, a talk at Congregation Beth Elohim in Acton, Mass., as part of Jewish Book Month. This is the end of book signing for the evening, and some folks are lingering to chat about what resonated with them from the talk. 11 a.m.: Sacred Heart Church Parish Center, in Lexington, Mass. (Across from Wilson Farms.) Talk about Faith Ed., followed by a discussion with Monsignor Paul Garrity and Imam Taymullah Abdur-Rahman, who has participated in a previous panel with me. (Free, open to the public.) For more information, check out the recent article in The Colonial Times (p. 35). Many thanks to Joyce Gillis for inviting me to speak at Sacred Heart. I’m looking forward to this event and thrilled to participate in a discussion with both the Monsignor and Imam Abdur-Rahman, the latter who wrote a fascinating piece recently on Huffington Post in the aftermath of the attacks in Paris and Lebanon. If you’re interested, you can find Taymullah’s article at this link. It’s called A Letter to Prophet Muhammad. Taymullah also is Harvard University’s Muslim chaplain. 2:30 p.m. (also on Dec. 6): I’ll give a talk as one of many speakers at LimmudBoston, a day of education, song, and activities about Judaism. My talk will focus on one layer of my reporting — the treatment of religious minorities and whether world religions classes in the schools can make a difference. The event is at Congregation Mishkan Tefila in Chestnut Hill, MA. 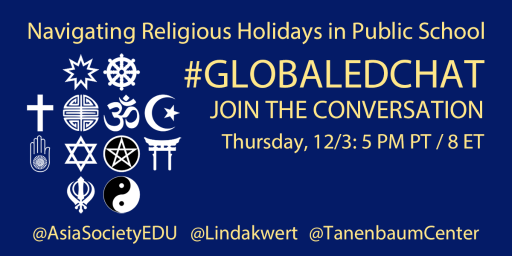 Live Twitter Chat on Teaching About Religious Holidays: Thursday, Dec. 3rd, 8 p.m. to 9 p.m. EST. Join me as I moderate a live Twitter chat for #globaledchat, sponsored by Education Week’s Global Learning Blog. Experts from the Tanenbaum Center on Interreligious Understanding will participate. Reflections on Ezra Schwartz: I wrote a piece reflecting on the death of 18-year-old Ezra Schwartz in the West Bank – and how it struck home in many ways for WBUR’s Cognoscenti. Faith Ed. Excerpt in the Tampa Bay Times: Many thanks to the Tampa Bay Times for publishing an excerpt of Faith Ed. in its recent Perspective section. The excerpt comes from the chapter titled, “Whose Truth Should They Hear?” about uproar over a guest speaker on Islam in Hillsborough County schools. Toward the end of the chapter, I introduce readers to Hepah, who’s Muslim, and Katie, who’s Jewish, and the friendship they’ve formed and how they are learning from each other. FYI, this is one of my young son’s favorite sections of the book. You can find the Tampa Bay Times excerpt here. As always, thanks for reading. My final event in 2015 will be on Dec. 13th at 9:30 a.m. at Tifereth Israel in New Bedford, Mass. Many more talks are in store for 2016. Stay tuned. Tagged Faith Ed, Imam Taymullah Abdur-Rahman, Lexington, Massachusetts, Monsignor Paul Garrity, Sacred Heart Church. Bookmark the permalink. 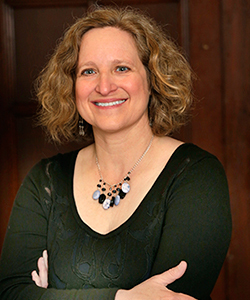 Linda K. Wertheimer is an award-winning education writer and essayist. She was previously the education editor of the Boston Globe and a reporter at the Dallas Morning News and Orlando Sentinel. Her work has appeared in numerous publications, including Writer, the Atlantic online, Tiferet, Moment, and the Boston Globe Magazine. 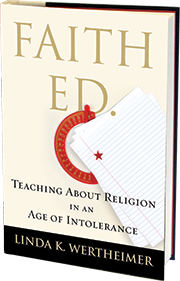 Sign up for Linda's newsletter to receive updates on Faith Ed and other news. Linda K. Wertheimer | Powered by Mantra & WordPress.